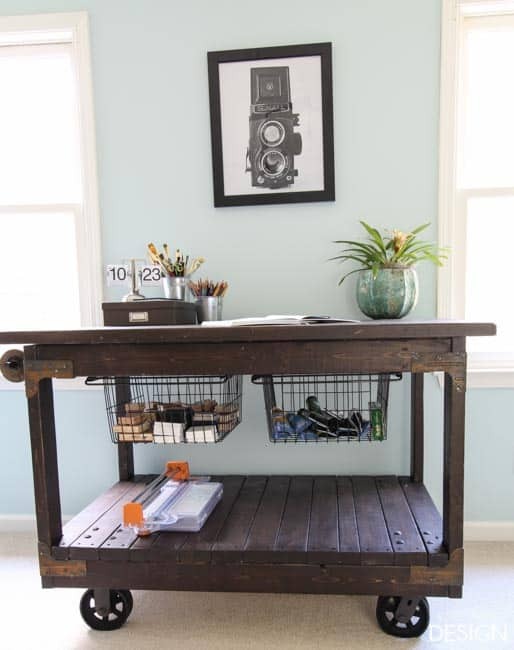 This project is kind of like what you would get if a craft table and a vintage industrial cart got married and had a baby. Weird I know, but that’s just how my brain works. I like to juxtapose the “what I need” with “the look I want” and this is the result. Because what I really desired was a craft table I could move around the room. 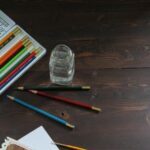 Sometimes it is convenient to be able to work on all sides of a table and other times, having a craft table in the middle of the room is just awkward and makes a space feel cramped. I have had one of those craft tables set on top of a pair of square shelves for many years in my studio/office. 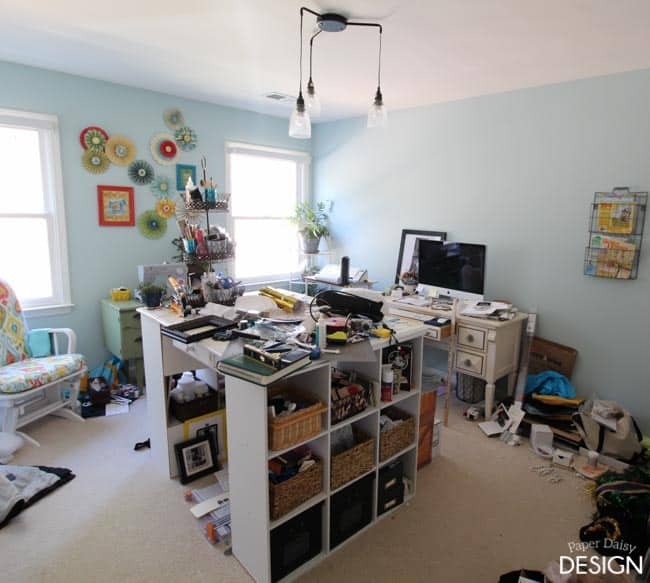 It was nice to have the extra storage of all the little cubbies, but when you look at this completely embarrassing photo of my studio just before this craft table was built, it obvious it did nothing to contribute to my tidiness. Honestly, the room has been ignored and became a dumping ground for projects. I figured the only way to encourage myself to get it tidy and keep it that way to take everything out and start over fresh. Most of what you see here are reincarnations from other, more put together, studio rooms in my previous homes. 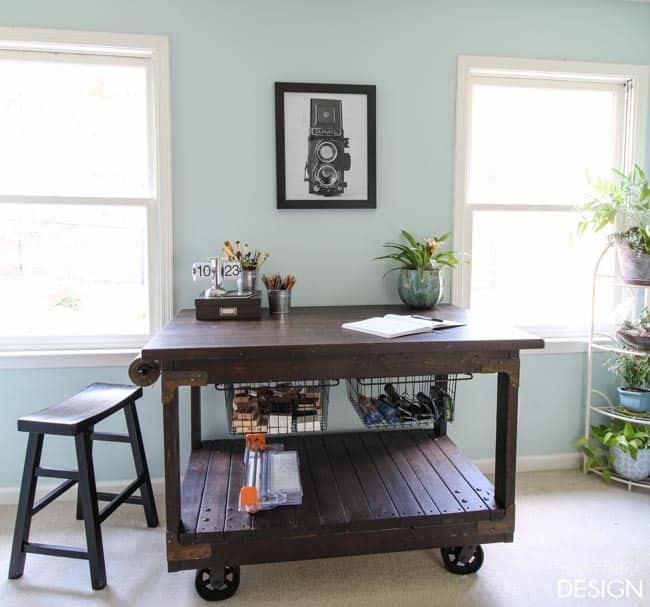 This craft table cart project is just step one in a complete makeover of my studio space. I truly couldn’t be more excited to finally begin to see the room moving in the direction I have long envisioned. 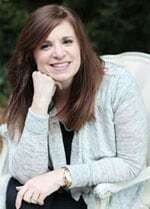 For your convenience, this post includes affiliate links to products used. 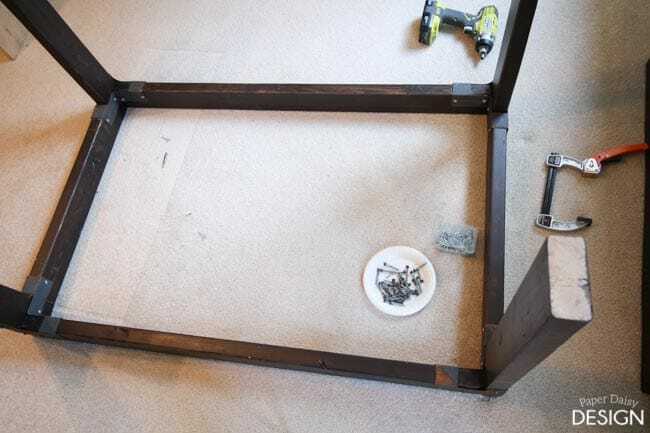 To build the craft table, I started with an easy to build Heavy Duty Workbench kit from Simpson Strong Tie. You can purchase one here. 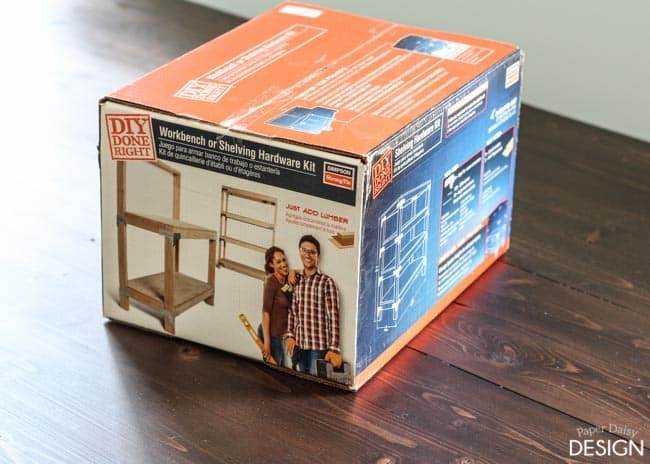 With this kit you can build a strong, sturdy work table easily in a weekend. 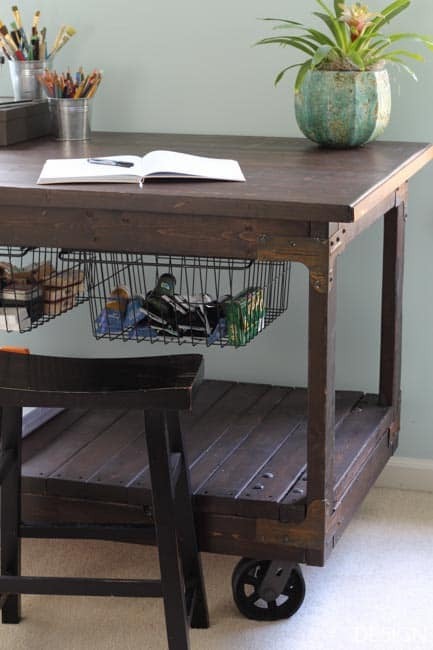 My industrial cart table probably took the equivalent of two weekends to build the top, stain and finish all the pieces, and then assemble. 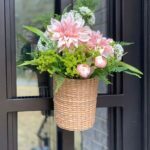 By making a few modifications and embellishments, the workbench kit was transformed into this. The simple sketch above will be updated with a more detailed plan and a cut list soon. The key to part of transforming the work bench into a industrial cart was to flip the bottom brackets/connectors upside down. This allows the industrial wheels to be added and attached flush to the bottom. Don’t you just love those industrial wheels? Here’s a link to the wheels I used. I think the price is very reasonable considering how extremely heavy duty they are. 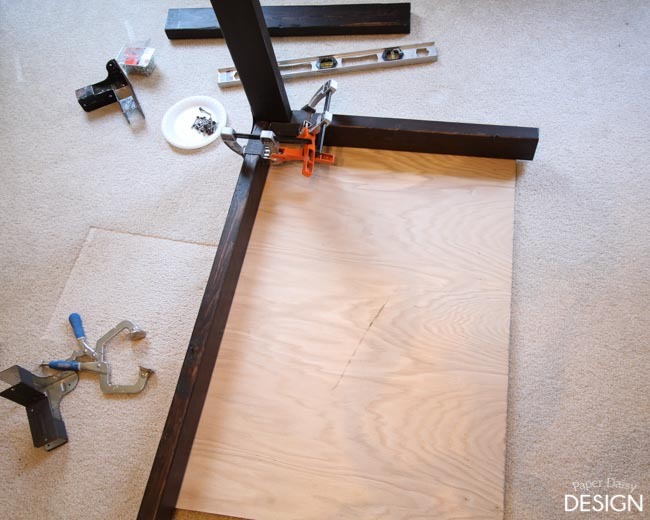 In the traditional workbench instructions, you are supposed to use plywood for your base and top. That’s another place I went rogue. Plywood does not fit the industrial look I was after. The top and bottom shelf needed to be a bit more beefy and 2×4’s fit that bill nicely. And they are cheap! 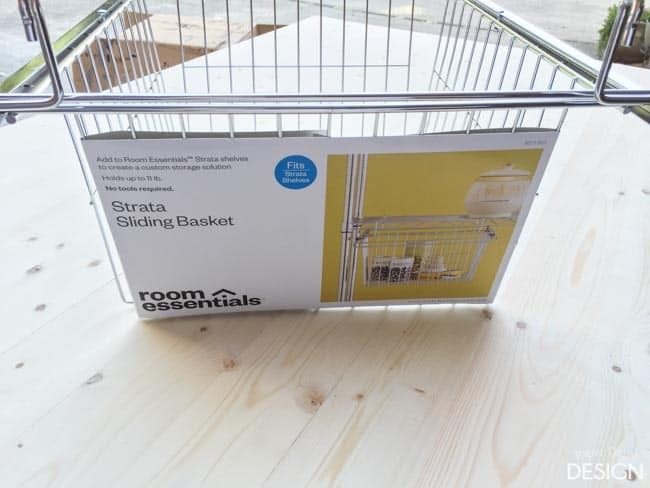 We began by deciding on final dimensions for the craft table/cart. Roughly, 51″ wide by 34″ deep was the size that best fit my space. 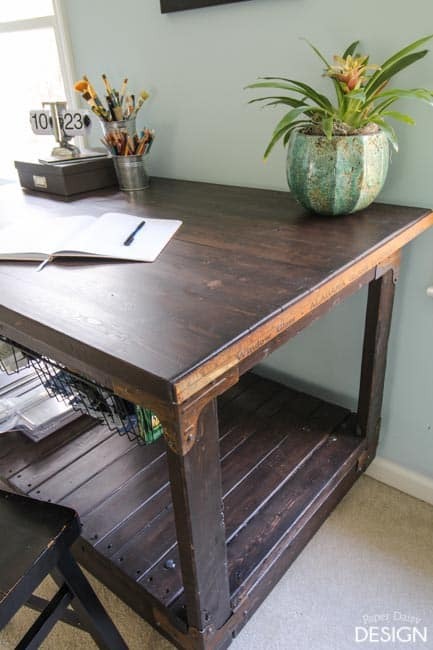 It took (17) 2×4 boards to build this craft table, which means the wood for this project was under $40. 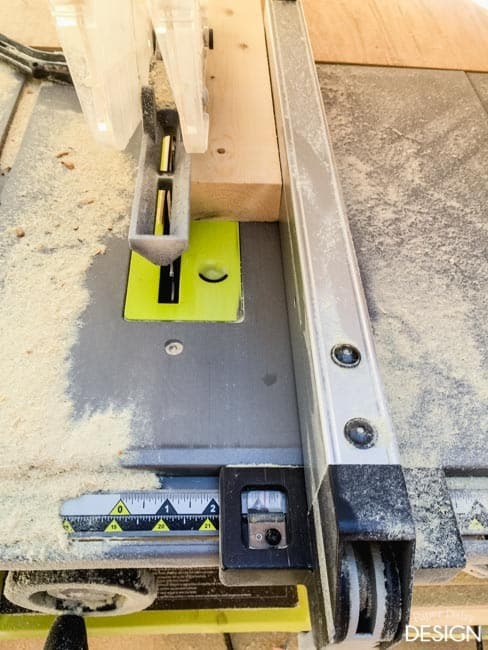 In order to create a smooth top work surface we ripped the 2×4’s down with our table saw. 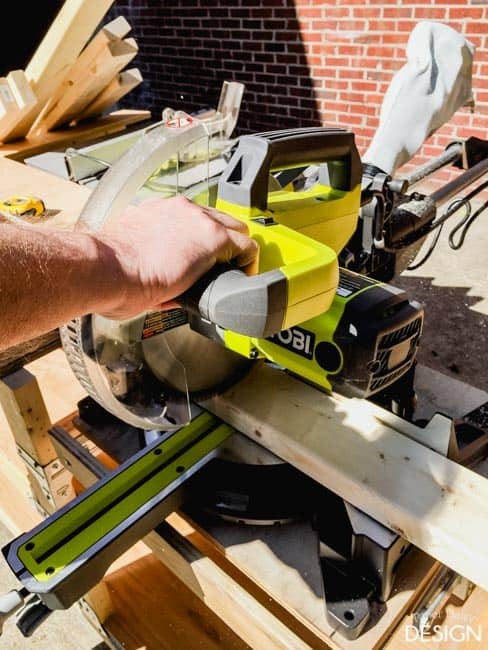 For the first rip we set the saw to 3 3/8″. 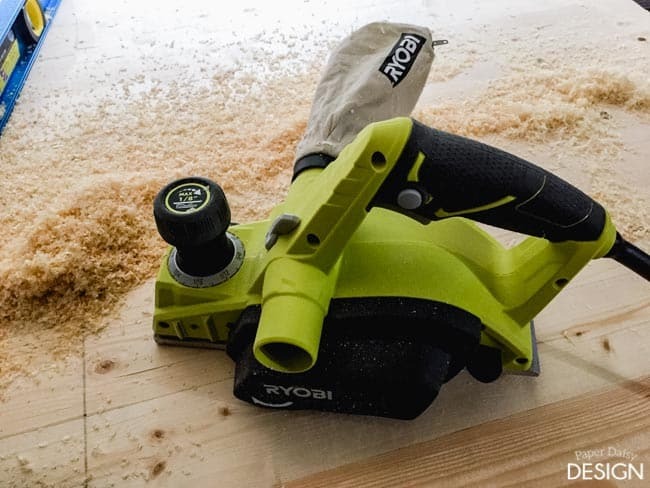 After cutting all 11 boards on one side, we flipped them around and set the blade width to 3 1/8″. Once the boards were all ripped, I began matching up the edges to piece together the top, numbering them as I went. 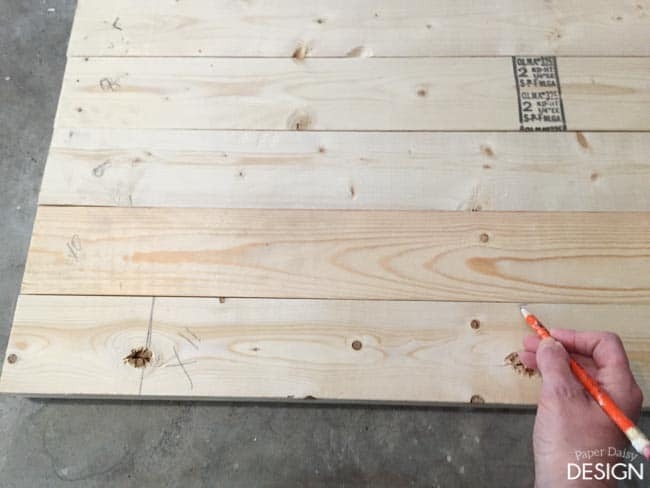 It is difficult to rip long 2×4 boards completely straight with a table saw. 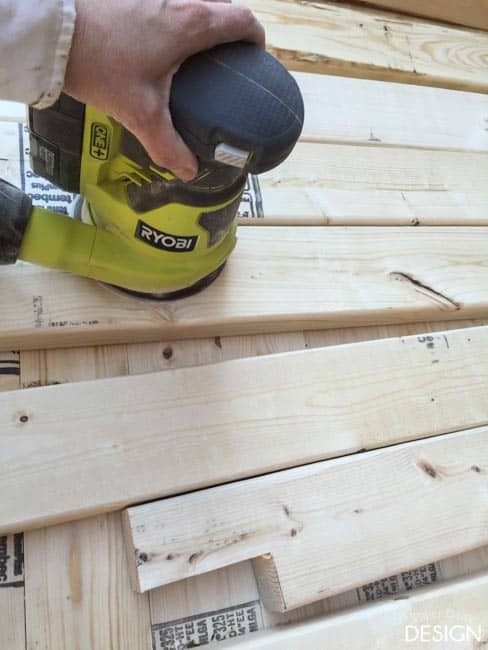 Pine 2×4’s are just not square and true, no matter how carefully you choose them at the hardware store. I marked spots where the seamed edges did not meet and used a Ryobi powered hand planner to straighten or smooth them out. 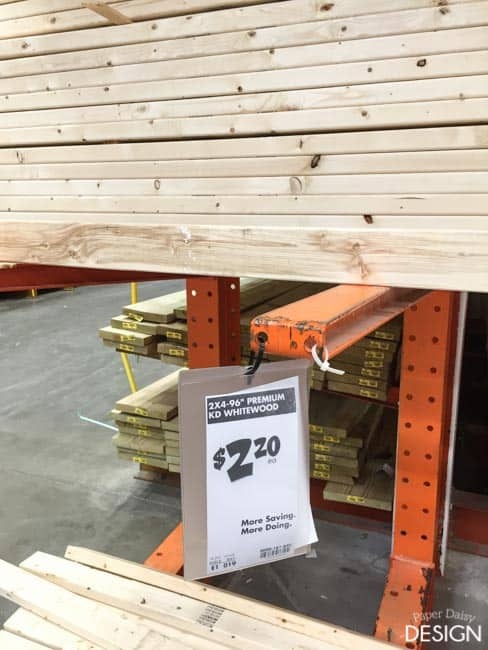 Don’t forget to number the boards before you move them to keep them in order. 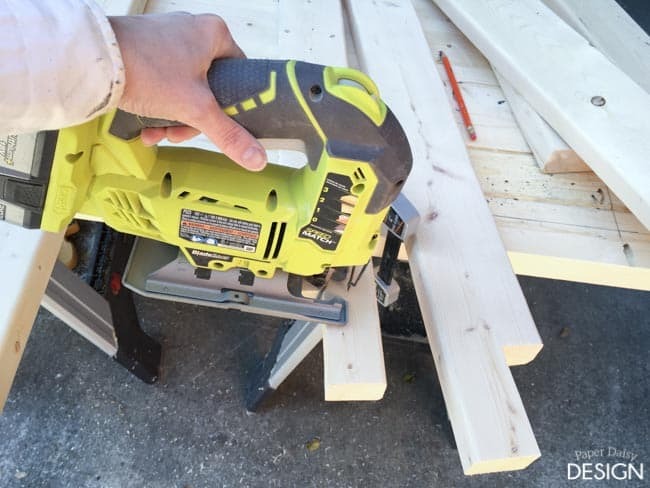 While a power planner may seem a bit intimidating and like all power tools require careful use, it is actually very easy to use and is highly effective. Once all the edges were nice and square and fit together as seamlessly as possible, we used a Kreg Jig to join all the boards. As the boards were screwed together, we used wood glue to create a super strong bond. Because 2×4 wood also has inherent issues with cupping, we found it nearly impossible to avoid the transference of this cupping to the completed top. We did attempt to re-connect with no improvement. We improved the severity of the cupping moderately by placing scrap pieces of granite on the top overnight while the glue dried. The rest of the imperfections were taken care of by using the planner again on the top. I began by smoothing the seams of the joints. In hindsight, I think it is better to work on getting the top level first and then, if there were still seams that needs to be made smoother, then work on those. I did a good bit of research in advance of this project and found the often repeated tip of dividing the tabletop into 4 quadrants helpful in finding and removing your high and low places. Once your problem areas are marked you can plane the surface until it is level all the way across. As the planner removed high spots it created these divots. Those were easily removed by adjusting the dial by small increments and running the planner over the area several times. 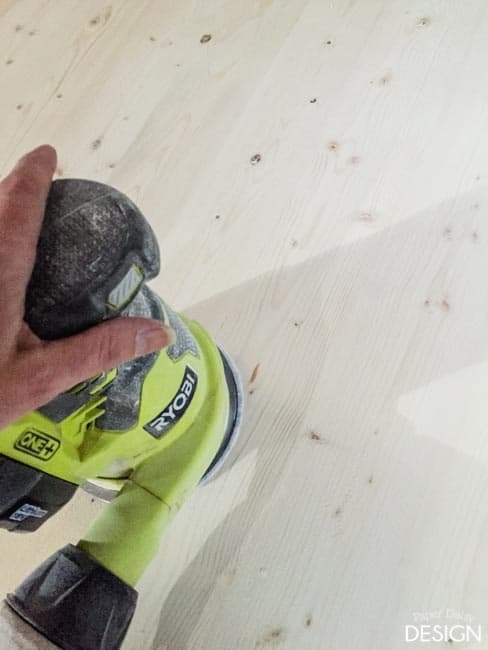 When the table was nice and level, it was time to start sanding with an orbital sander and 80 grit sand paper. Gradually, I increased the sandpaper to 120, 220 and using a sanding block, hand sanded with 400 grit sandpaper. 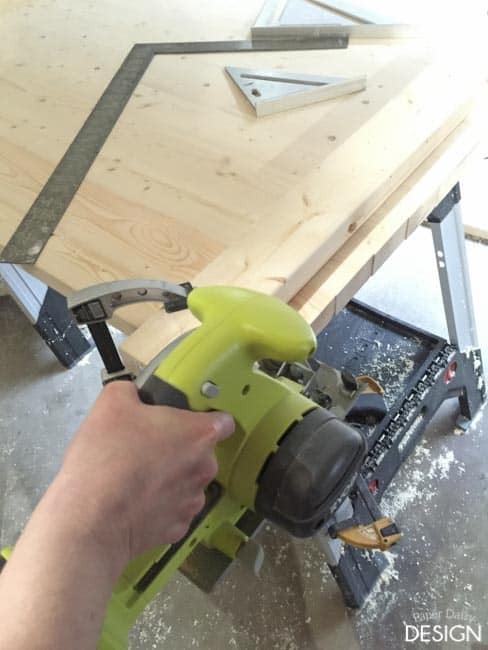 About half way through this process, I used a circular saw to trim the rough edges on the sides of the table top. 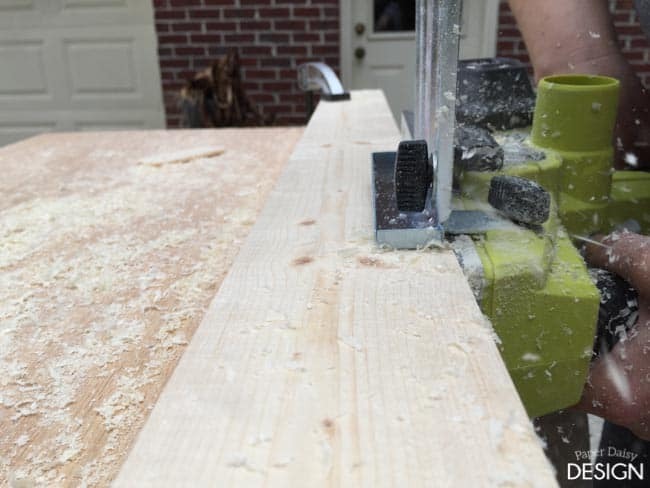 Using clamps, a square and the straightest 2×4 I could find, it was easy to cut a straight edge. 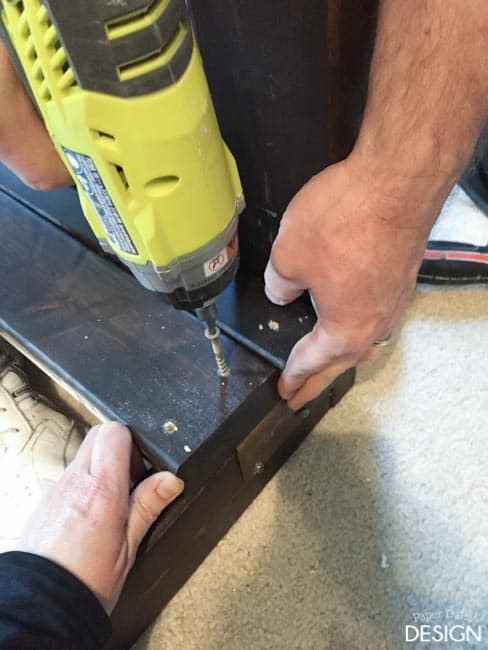 We initally thought we would run the edge of the table through the table saw, but once the top was assembled, we realized the weight of it would make this rather difficult. Now I was ready to move onto preparing the rest of the table parts. 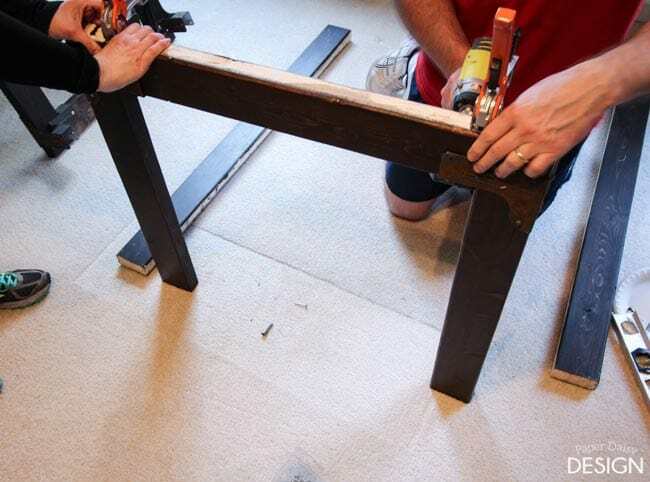 We cut the legs, apron runners and the deck for the bottom using a miter saw. See diagram for dimensions. 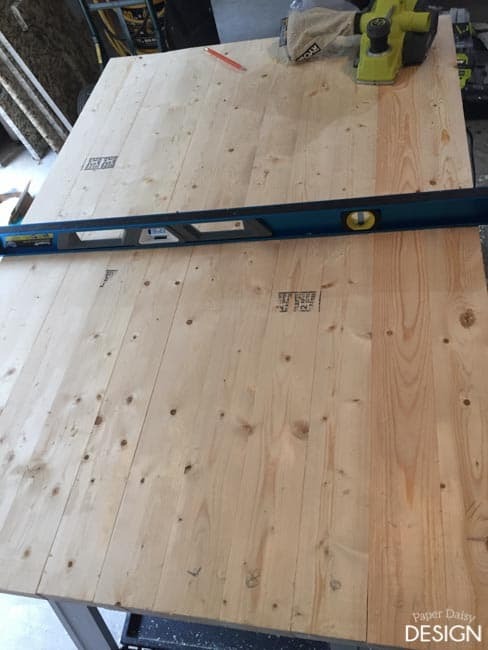 Just as described in the directions for the Simpson Strong Tie Workbench, I created notches on four of the deck boards to go around the vertical posts. To insure a satisfactory finish, I sanded all the pieces and parts with 120 grit sandpaper. But before I began the finishing, we loosely assembled all the parts to make sure everything fit according to the plan. 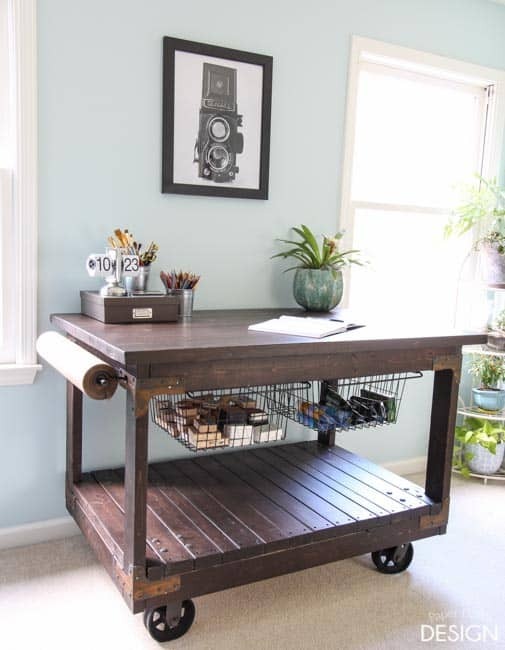 I wanted to create a realistic vintage look for my craft cart table. I thought a knock-off of the Salvaged Brown finish from Restoration Hardware would do the trick. I share the complete details on how I created this finish in a follow-up post, click here. Y’all, I couldn’t be more proud of how fantastic these humble 2×4’s look. With all the pieces cut and finished, it was time to gather the pieces and put it all together. It’s not unlike building with tinker toys at this point. 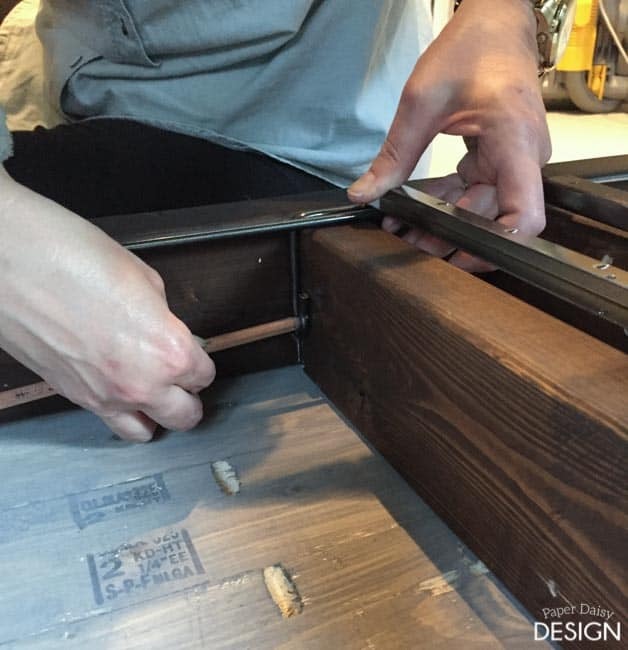 To build with the connectors that come in the kit, we began by installing them on the vertical posts as directed in the standard workbench instructions. I should mention that I replaced the outside screws that came with the kit with hex-head screws like these. I just thought they looked better. I continued to use the screws from the kit on the inside. Use clamps to keep the rails seated in the connector flush to keep it all square, working your way around all four corners. 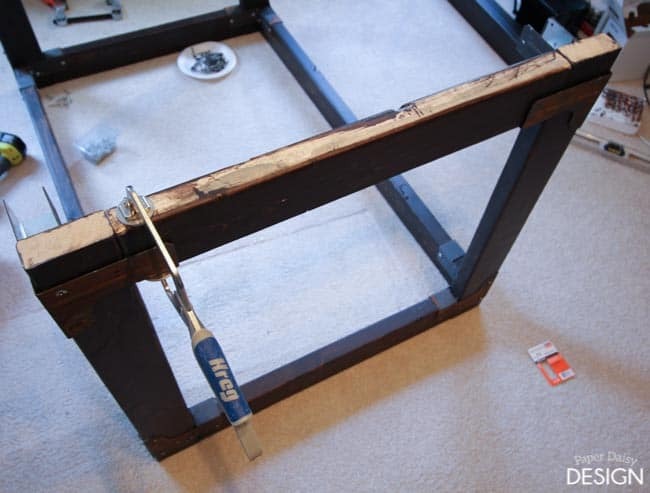 When you build the bottom, remember to keep the connectors “upside down” so that your project looks like a cart, not a work table with legs. Then you are ready to move on to connecting the top rails. The base should look like this when you are done. Now you are ready to start adding the deck and the wheels. There were a few obstacles to overcome with installation of the wheels and the deck. Initially I was just going to nail the deck boards to rails. 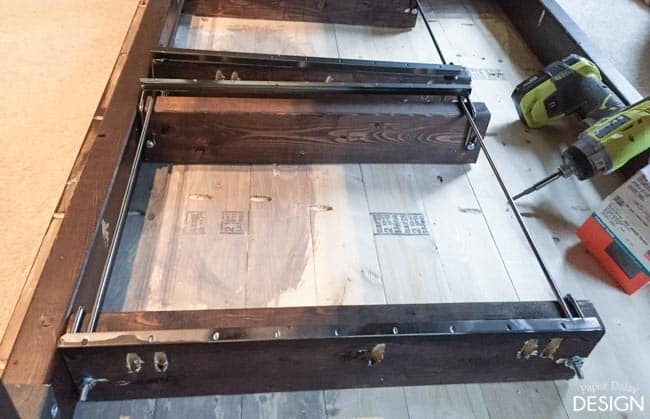 But for both esthetic reasons and added strength of the connection, we attached the deck boards with counter-sunk screws. The only place this presented a bit of a problem was over the connectors in the coners. We pre-drilled through the top of the board until we hit the metal connectors. 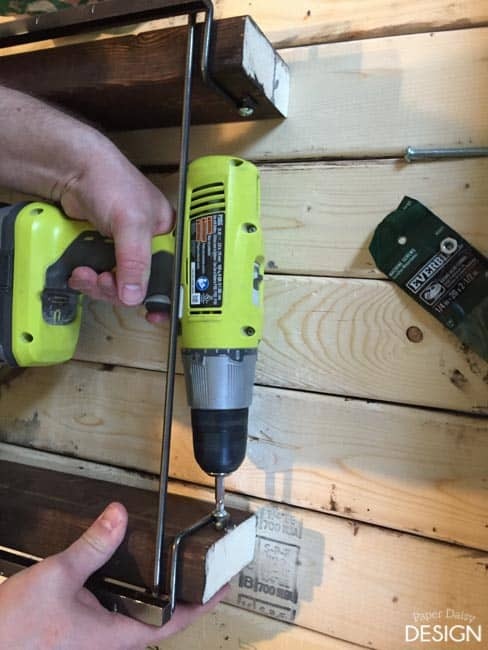 Then, using a metal drill bit we predrilled a hole for the screw through the metal. 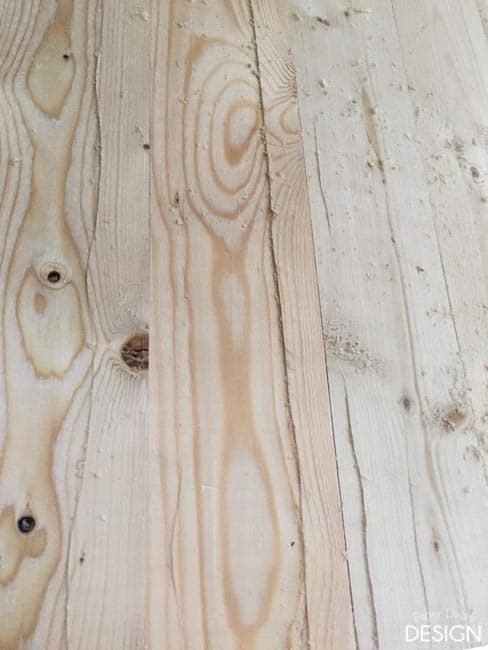 We continued screwing the first three deck boards down on both sides, pre-drilling for each hole in the boards to avoid the 2×4’s from splitting. We only did three boards on each side at this time for ease in maneuvering the base while attaching the wheels. So, now we were ready to attach those awesome industrial wheels! 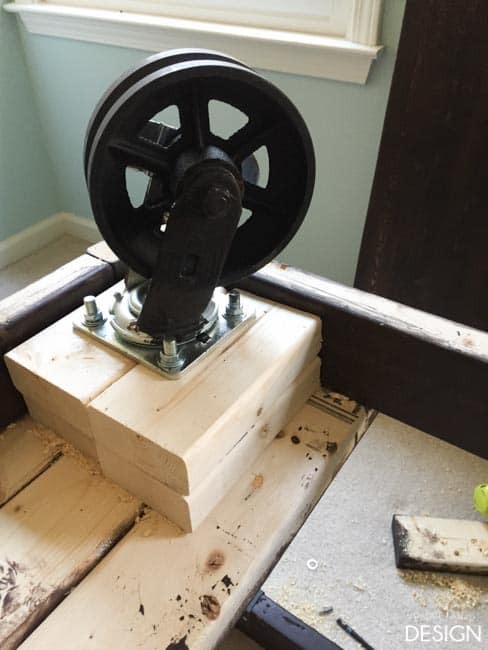 We used 3/8 x 5 1/2″ carriage bolts, nuts, washers and lock washers to attach the wheels with 4 rectangular scraps of 2×4’s at each corner. After three muddled attempts, we arrived at a process of getting the wheels attached that worked out fairly smoothly. For a visual reference, this is what one of the installed wheels looks like. 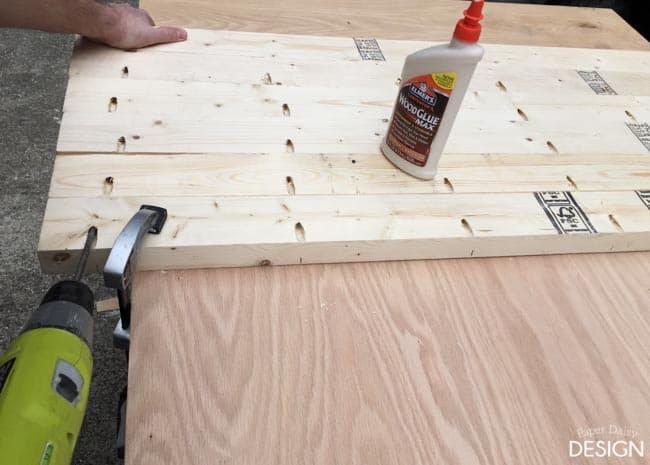 These scraps of plywood have been nailed and wood glued together, but not attached to the deck before the bolts go in. 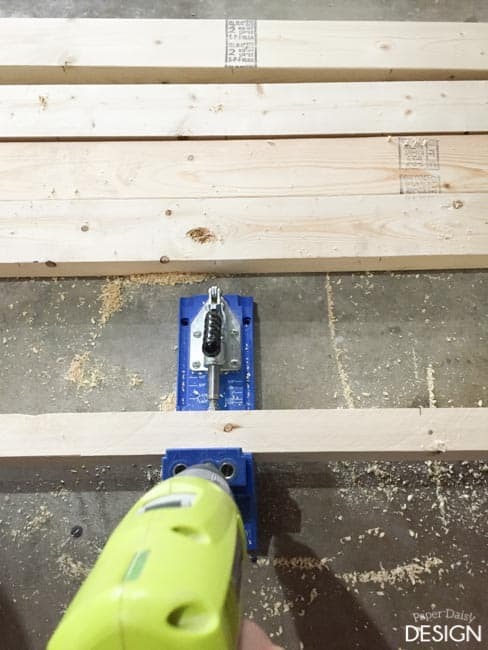 With the 2 stacked scraps of plywood clamped to the back of the deck drill each hole as far as your drill bit will go. 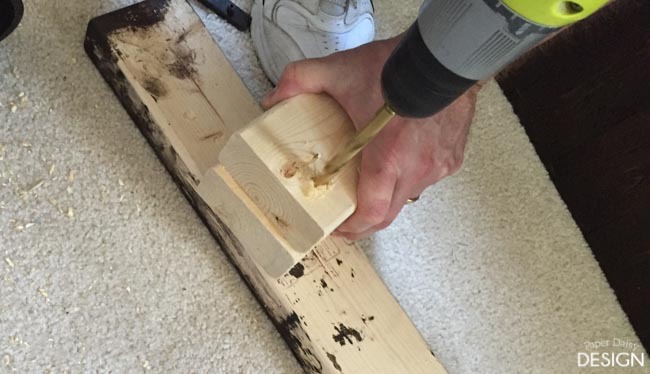 The 3/8″ wood bit we used went through the deck and partially through the first block. 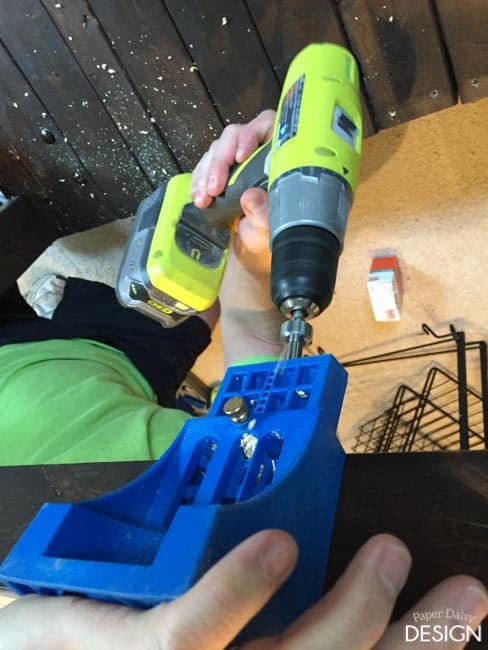 Remove the clamps and the blocks and finish drilling straight through the holes created. 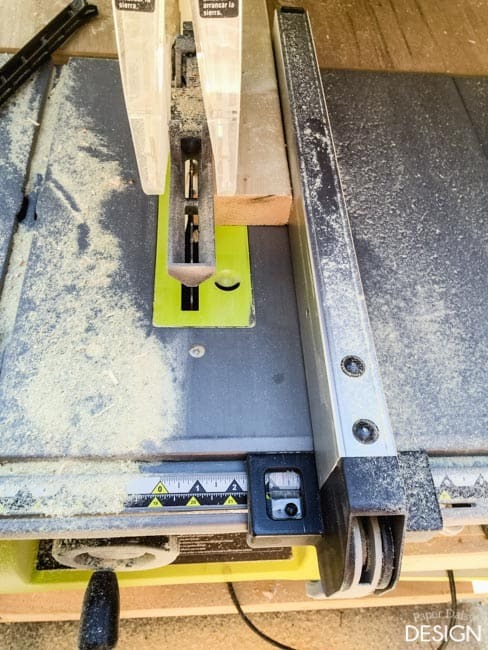 As a safety precaution I would recommend clamping the block to something. My always cooperative hubby wouldn’t listen to my suggestion. Ha! 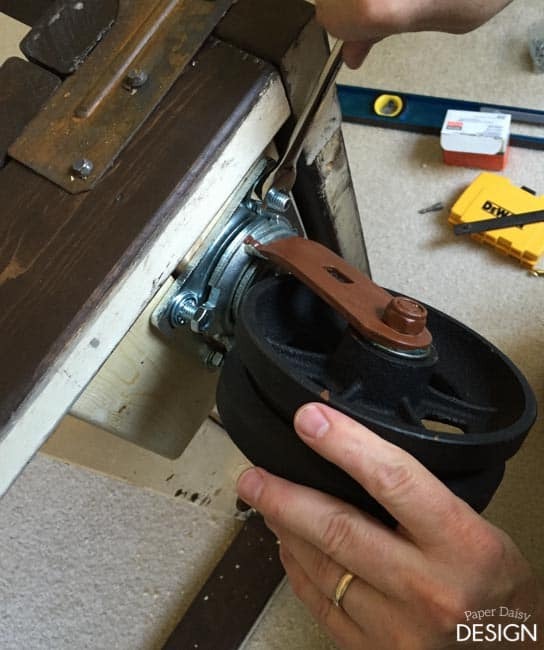 You will need to counter-sink the neck of the carriage bolt for to sit flush. 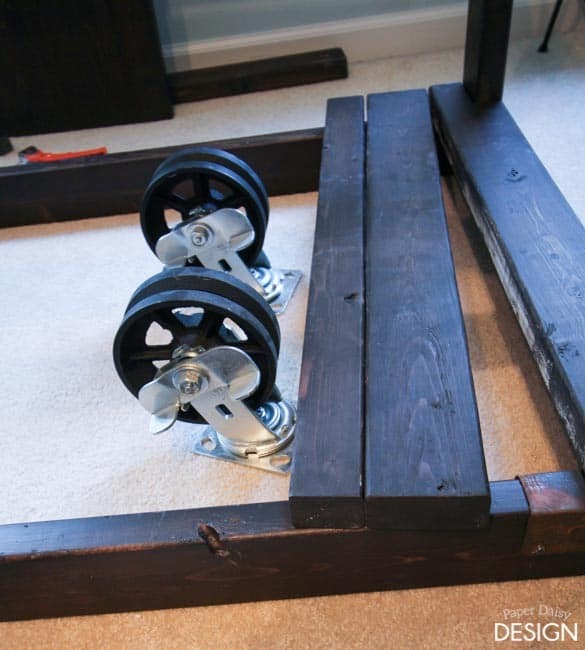 Then, feed the bolts through the holes, the blocks of wood and attach the wheels. Even with this improved method it took a bit of coercion to get the bolts to go through the deck and the blocks. Attach the lock washers and nuts with a 9/16 wrench. Here are the wheels installed and the brackets for the wheels painted. I will cover the how I painted and created the rusty finish on these, as well as the connectors, in another post. Then we finished attaching the rest of the deck boards, pre-drilling as we went down each side. 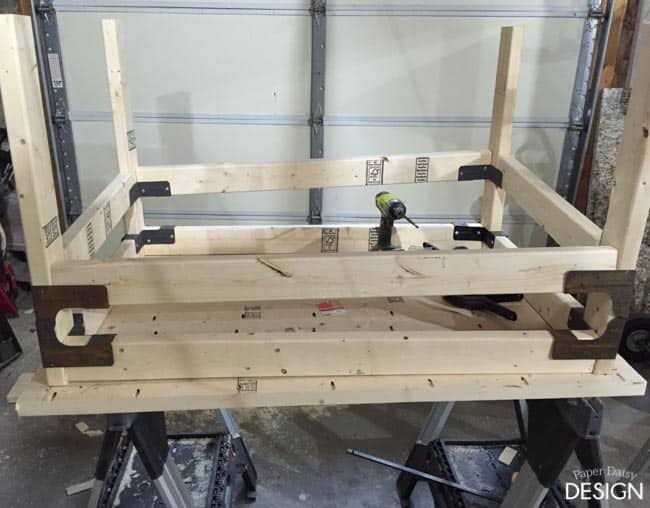 In our initial planning, we intended to use brackets to attach the top to the apron base. But we realized we could save some money by just using a Kreg Jig to secure the top. The detailed sketch will show this step, so you can avoid making a huge mess all over your deck boards. With the top attached, we flipped the top upside down and added the sliding baskets from Target. They are actually intended to be used in wire closets or shelving. So we had to find a clever way to attach them to the top after they were given a coat of flat black spray paint. 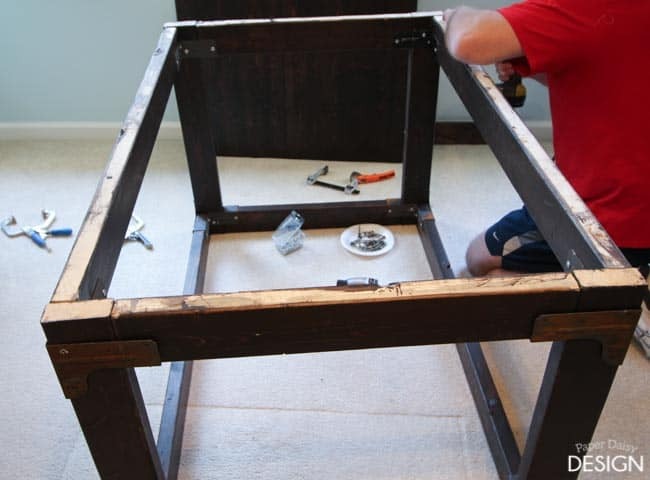 We attached runners, using a Kreg Jig, to the underside of the table top and bolted the baskets in using the hooks that were intended to hang on a wire shelf. Using the chalk pencil, we marked where the hooks hit the runners and where the runners needed to be jigged once the brackets were in place. We pre-drilled the holes and slipped the bolts through the hook and attached nuts and lock washers to each of the sides. Then we were ready to flip the table over and slide in the baskets. 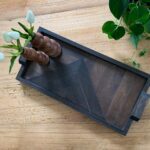 They are a great alternative to an extra shelf and add to the industrial look. The generous size of the baskets allow for a lot more crafty items than what I’ve got in them now. Give me some more time and I bet I can fill them up! To help protect the top during painting projects, I added a roll of craft paper to the side apron. 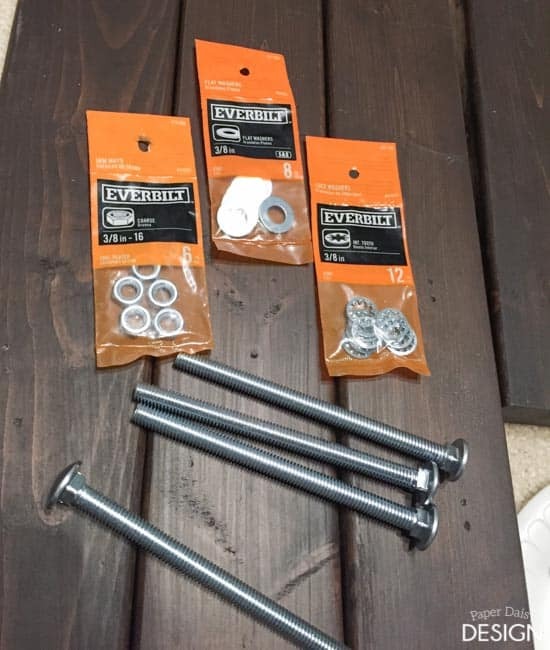 Again, we found the bolts, 3/8″x 6″ eye bolts and nuts, needed to be positioned on the metal connectors. It turns out this time, the hole fell right where one of the screws go into the brackets. 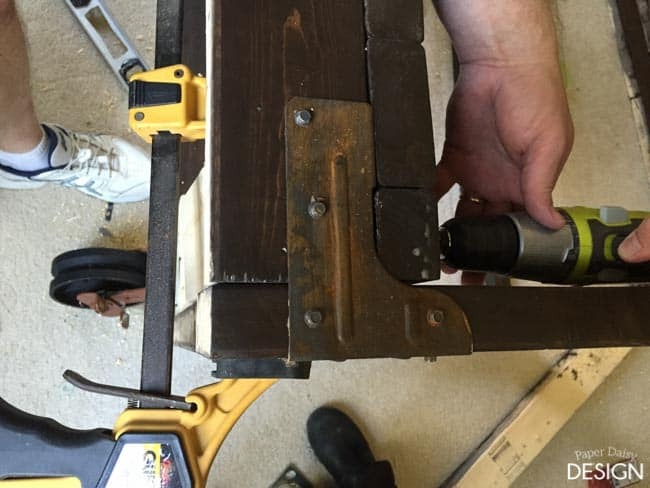 We removed those screws and increased the size of the hole to accommodate the bolt and added a nut on both sides of the wood. 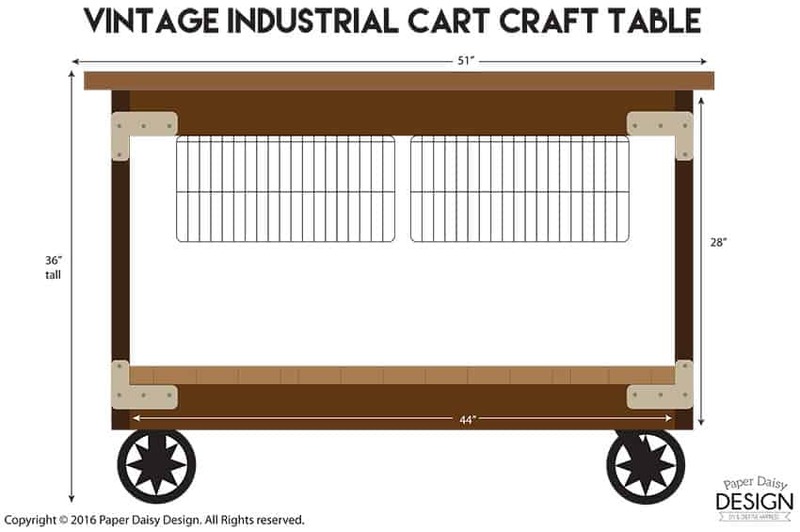 We are almost done, but I had one more little accessory to add to this tricked out industrial craft cart! Did you notice it yet? 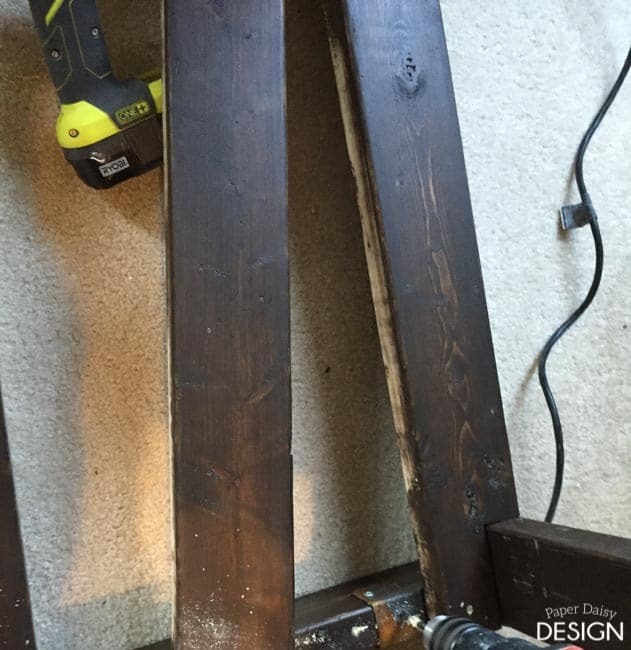 I nailed a vintage yard stick to the side of the table. I’ve been wondering when I’d find a use for that stash of rulers I’ve been hoarding. 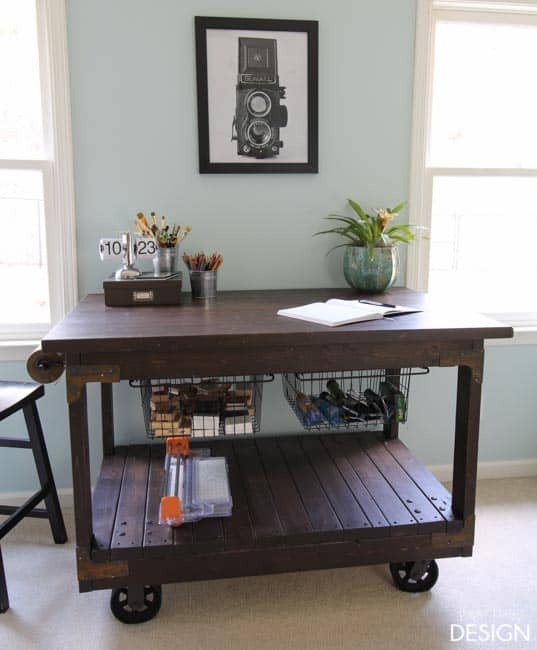 I’ve got to say I’m a bit in love with my creation, the vintage industrial craft cart table. That’s a mouthful, huh? Did you catch that this project was created solely with 2×4 lumber? 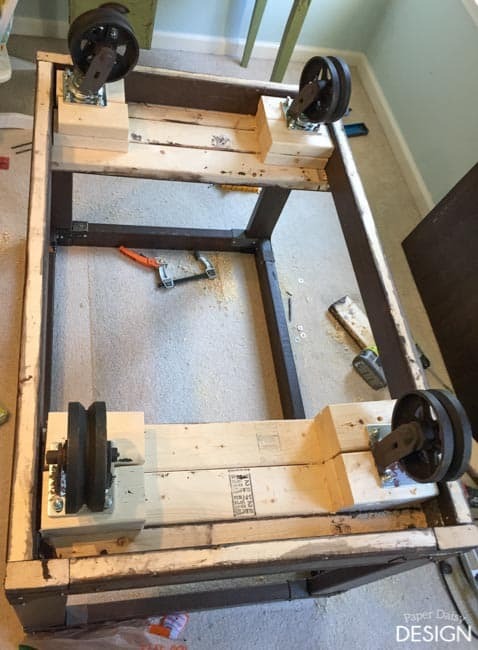 It cost me under $225 to build even with all the hardware? 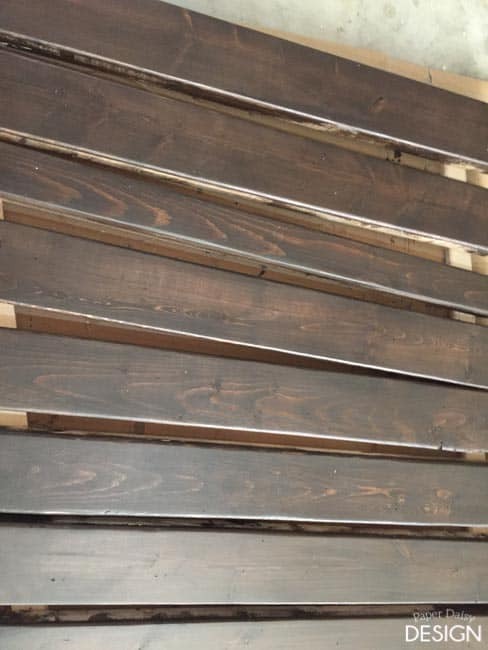 Want to learn how to create that custom Slvaged brown finish for your next project? Click here. 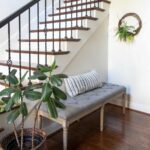 Want to see some other easy and inexpensive 2×4 projects? 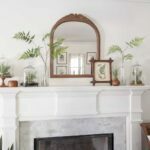 Check out these other fine blogger 2×4 Challenge projects below. This project is unbelievable! I cannot believe this was just made from 2x4s… you have outstanding vision! Donna, coming from you this is a thrilling compliment. I have long admired your creative work. Thank you for stopping by! This is so great!!!! It look like it’s store bought, it’s that perfect!!! Love. I want this table! WOW! Great job on the 2×4 project and on a well written tutorial. I will be pinning and sharing for sure. I looove absolutely every detail of this table! 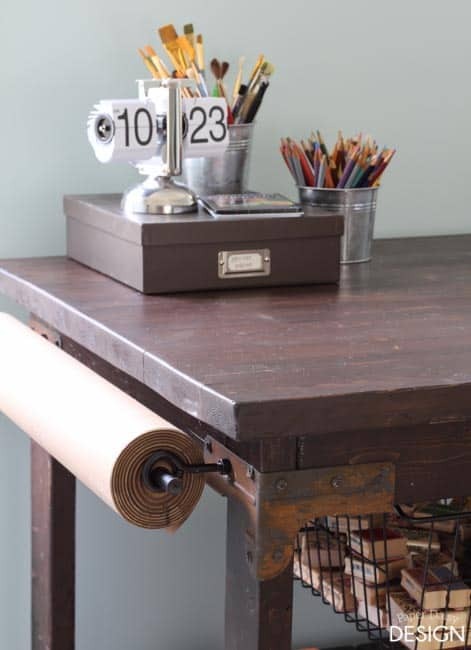 The paper holder, the vintage ruler … oh and the hardware! Well done indeed! You should be very proud! If you are at all interested in joining in on one more link party, I host Making Broken Beautiful every Thursday thru Sunday. 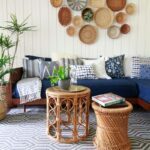 It is a furniture and home decor party and I would be so happy to host your talents! I hope you have a great weekend! 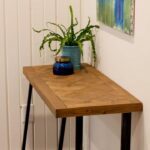 Love, love, love this table! Would also act as a GREAT gift wrapping table during the holidays…. Sorry, no the table is not for sale. However, I do offer plans on how to build your own. The diagram at the top of the post gives dimensions on the scale of the table. Freakin’ brilliant. 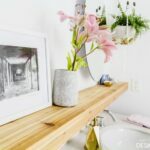 I’m in love with how you did the wire basket drawers – we are building our own open shelving base cabinets in our kitchen, work-table style, and I knew I needed some kind of cool drawer situation for things like dishcloths and cloth napkins, and this is now Pinned for inspiration! Love your table. And all the things you made. 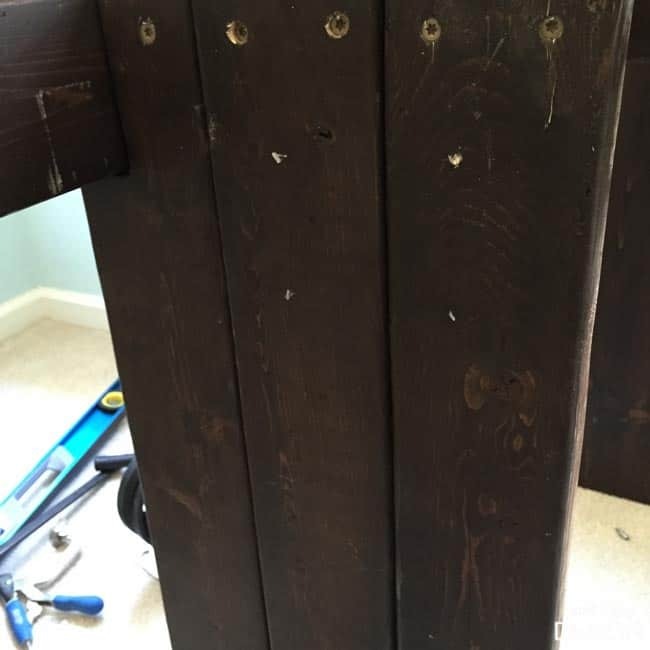 I have a day bed made out of 2 x 4’s & 2 2×6’s. Better made then the store beds. Where did you find the corner brackets and wheels. Love the project and I was already building something similar for our pantry.